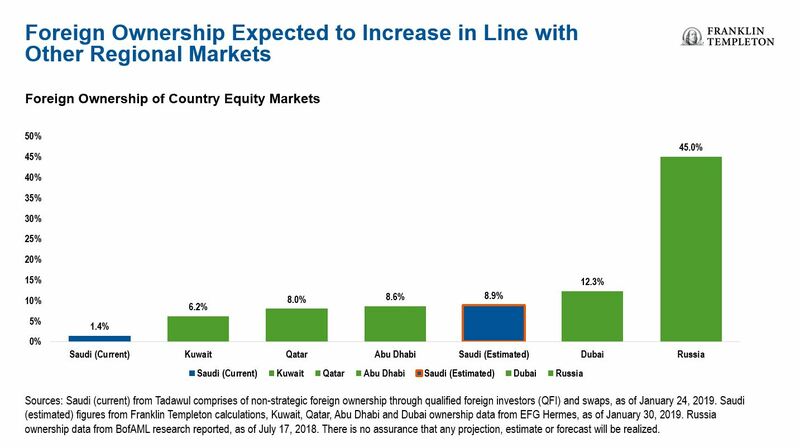 Last year, index provider MCSI announced it would elevate Saudi Arabia to emerging-market status, which we believe should provide the positive momentum needed for stocks in the Middle East North Africa (MENA) region. Kuwait will also be under consideration for emerging-market status in MSCI’s annual market review in June. Despite the uncertainty surrounding global equity markets this year, we see pockets of opportunity for MENA investors. We anticipate a sizable flow of foreign capital to accompany MSCI index inclusion, along with continued fiscal reforms, improving corporate earnings and relatively attractive valuations. Our upbeat view on MENA is underpinned by what we view as one of the largest-ever liquidity events to occur in the region. Index provider MSCI’s decision last year to include Saudi Arabia in its emerging-market benchmark was a milestone event. The event not only solidifies the Kingdom’s firm position on international investors’ radars, it also serves to bring the wider region into the mainstream of emerging-market investment. Overall, we believe Saudi Arabia’s inclusion in the MSCI Emerging Markets (EM) Index2 will have a positive impact on the market and is likely to attract approximately US$40 billion in foreign inflows into the Kingdom this year.3 With Saudi Arabia’s actual emerging-market implementation set to take place this year in two phases, May and August, we expect a large portion of this new investment to arrive this year. As it stands, Qatar, the United Arab Emirates (UAE) and Egypt together make up a weighting of less than 1.6% in the MSCI EM Index. Saudi Arabia’s initial weighting is set at 2.6%, with the share expected to increase if, and when, state-owned oil company Saudi Aramco is floated on the stock exchange. 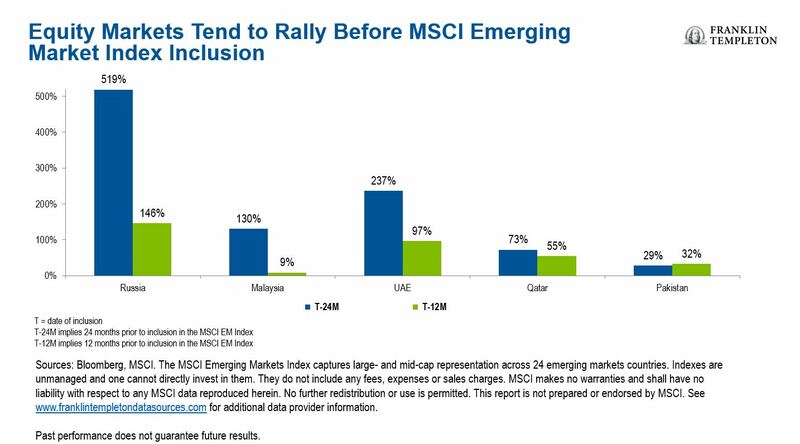 Kuwait is potentially the next in line for an MSCI emerging market upgrade. Last year, FTSE Russell said it would add Kuwait to its FTSE Russell Emerging Markets Index, a move that could bring potentially billions of dollars in passive investment. FTSE’s inclusion will be split into five phases spanning the course of one year, effective March 2019. 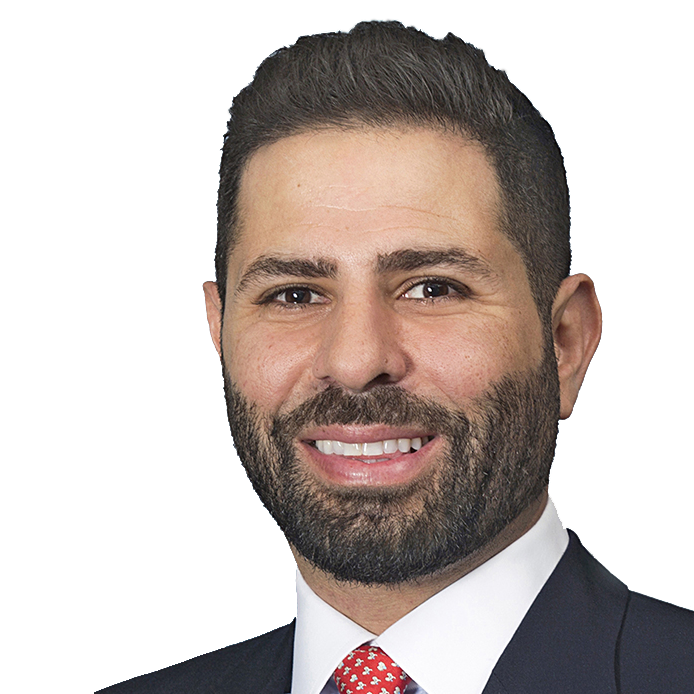 We are excited by these transformational capital market developments as we believe ultimately it makes the MENA region difficult to bypass from an investor point of view. It also underscores our belief that 2019 will be the year of liquidity for the MENA region. Another factor supporting our constructive view on MENA stocks this year is the region’s fiscal reform story. The progress made over the past two to three years is encouraging to us. Investors have responded well to the fiscal reform measures undertaken, and we believe it’s essential for investors to see MENA countries follow through with real change. We are acutely aware of the implementation and execution risks involved in such progress, and would view any form of “fiscal slippage” in 2019 a cause for concern. While the outlook for economic growth in MENA this year remains muted, there is still some economic expansion underway largely driven by pro-active government spending. When the region is viewed in a broader emerging-market context, the case for MENA equities becomes a compelling one, in our view. One major benefit of the region’s mostly US-dollar pegged currencies is that it makes MENA less vulnerable to currency fluctuations other emerging markets might experience. It is worth noting some potential hazards for MENA stocks this year. These include a deterioration in regional geopolitics that could dampen global investor sentiment, while a sustained drop in oil prices might stymie government spending plans and fiscal reform commitment. However, our view is that the governments in the region have collectively shaved around US$15-$20 a barrel off their required break-even oil prices due to the reforms implemented already, giving them space to run their economies counter-cyclically. As we head further into 2019, the list of worries for global investors continues to grow. But in MENA we find there are clear reasons to be optimistic. A combination of solid fundamentals and significant liquidity drivers makes the year ahead look to be an exciting one for investors in the MENA region. 1. The price-to-earnings (P/E) ratio for an index is the weighted average of the price/earnings ratios of the stocks in the index. The price-to-book (P/B) for an index is the current share price divided by a company’s book value (or not worth) per share. See www.franklintempletondatasources.com for additional data provider terms and conditions. Source: S&P Dow Jones Indices, December 2018. The S&P Pan Arab Composite includes stocks from 11 Pan Arab markets including Saudi Arabia. The index reflects the float available to GCC residents, which is typically larger than that available to investors based outside the region. Indexes are unmanaged and one cannot directly invest in them. They do not include fees, expenses and sales charges. Past performance is not an indicator of future performance. See www.franklintempletondatasources.com for additional data provider terms and conditions. 2. The MSCI Emerging Markets Index captures large- and mid-cap representation across 24 emerging-markets countries. MENA representation in the index currently includes Qatar, United Arab Emirates and Egypt. Indexes are unmanaged and one cannot directly invest in them. They do not reflect any fees, expenses or sales charges. MSCI makes no warranties and shall have no liability with respect to any MSCI data reproduced herein. No further redistribution or use is permitted. This report is not prepared or endorsed by MSCI. Important data provider notices and terms available at www.franklintempletondatasources.com. 3. There is no assurance that any projection, estimate or forecast will be realized.